It's Damian Lillard's world, we're all just living in it. In a season filled with great performances, Lillard gave us all another one on Saturday night in an 88-81 victory over Portland State. It was Weber State's toughest conference game yet and showed why the Vikings could still be a factor in the Big Sky race. They led by 7 at halftime (including as much as 15), and were up by as much as 9 with under 13 minutes to play. 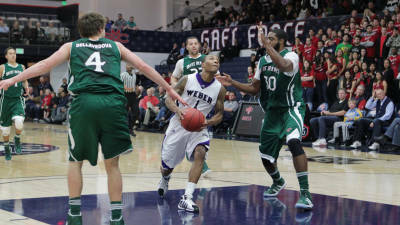 However, Lillard and the Wildcats were not to be denied. There no less than 11 NBA scouts in attendance, and Lillard gave them one heck of a performance. For the first time in his career he played all 40 minutes, finishing with 38 points, his 6th 30+ point game of the year. He shot 12/23 from the field, 8/14 from downtown (including 7/8 in the first half), and 6/6 from the stripe. In addition to the 38 points, he had five rebounds, five assists, one block, one steal, and only one turnover. Simply put, he was sublime, and continued to show he has the talent to at least be considered an All-American. Scott Bamforth also had a stellar game, scoring 21 points, with 19 of them coming in the second half. Weber State continues to win even with a patchwork lineup. Kyle Bullinger still might be a week away from returning, while Frank Otis is probably at least two weeks away. In addition, big man James Hajek dislocated his kneecap, and he will be out a while. Yet the Wildcats continue to win, riding the back of Damian Lillard.